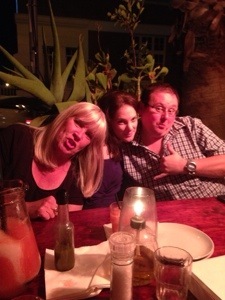 Last night I went to Peddlar’s on the Bend in Constantia for dinner. It was planned as a book club get together with the George escapees, but most couldn’t make it so there were only 3 of us who were there. Cait dropped me so I didn’t have to drive as I intended to have a bit of wine. In the end we had 3 bottles of Splattered Toad Sauvignon Blanc, a cheap and cheerful easy drinking wine. We talked and talked and talked to the point that we ended up being the last people in the place, not surprising when we ordered a bottle when they called last rounds. A bit cheeky but they let us get away with it. We were dining inside at the Italian Volare. I had the fillet steak,I have had it before and loved it so tried it again. It came with mash and mushroom gravy and I ordered a side of spinach which was nicely stir fried, still slightly al dente, not like most South Africans prepare it, puréed with cream. It was divine. Nikki had the veal Marsala which was nicely tender and Tina had the arrabiata pasta. But mostly we chattered and drank, it was a great night rehashing old stories and discussing people from our pasts. We all have successful husbands in some fashion or another, but all from different worlds. Only 1 of us is still married to the man she was with when we were friends. We all have our kids in common, we all were play group moms together and would have play dates for the kids and the moms! This was back in the early 90s, what seems like a life time ago. 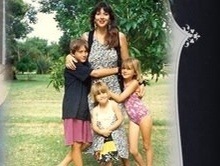 Here is a pic of me and my kids back then. I barely recognize me then…and then sometimes I barely recognize me now. I’ve changed so much in so many ways. Through pain is growth. I am a survivor – a chameleon of sorts. I shape shift into whatever is best for that situation. And I know some changes come through love. I was so OCD about anything moving in my house. An ornament turned 2 deg would set my teeth on edge. But then I had kids and to have a peaceful life I had to get over that. The love of my children was more important to me, it seemed silly to care if something was moved. But I still had my germophobia. And then I had 3 incredibly hairy dogs. And now every item of clothing, every object in the house is full of hair. Even hoovering every 2nd day or so it is mad. It takes daily run rounds with a broom or vacuum. But I don’t care too much. I just brush it off. Because again, the love for my 5 animals outweighs my OCD. That’s growth right? I know what matters and I know I am blessed with the life and family I have and I am so thankful of it all. Today is being spent just hanging round the house – Pixie is a bit better today and can stand a bit steadier. I feel less worried but she is still in the cage to avoid stair climbing, couch jumping and Navajo bashing. But I feel hopeful! Thanks for all of your kind messages about her. Like so many things which go viral, the no makeup selfie trend went a bit awry. In many cases it lost it’s meaning completely as most never donated. It was so easy – just SMS ‘PinkDrive’ to 40158 (in South Africa) to donate R20. In the UK millions were mistakenly donated to UNICEF due to someone sending out the wrong info. I guess as long as someone benefits, but it won’t be Cancer Research for a large chunk of sterling. 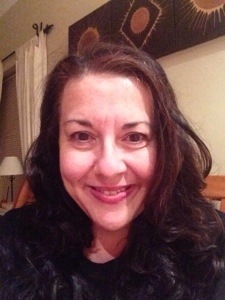 I published mine, and I never go anywhere without at least a bit of lippy! I took this late at night after Girl Geeks Dinner. And I’ve included my thank you text for donating. I hope others do too. The Geek Girl Dinner was held at The Wild Fig. I love their food and the venue is lovely but there is no decent wifi there or even 3G reception, so holding social media type events there is rather frustrating to say the least! 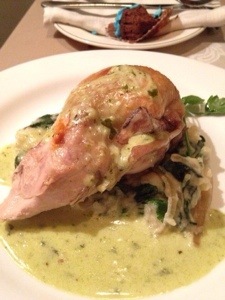 There was no starter, the main was a lovely big chicken breast, stuffed with a red pepper and feta type mousse, served on a bed of mash and spinach. 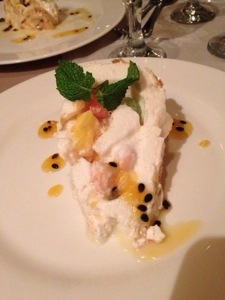 The dessert was a tropical fruit roulade in a coconutty meringue. It was average to me, I found the texture off putting, but everyone else seemed to gobble it up! There were the usual fab goody bags with gifts from the sponsors, chocolates, biscuits, Moroccan oil, magazines and other bits and pieces. My little Pomeranian Pixie has injured her back. She went tumbling down a hill chasing an ibis, they are called hadedahs in SA as the noise they make sounds like that. Haaaadeeedahhhhh. It’s loud! Anyway she fell on a huge rock and badly bruised her back. She can’t stand on her back legs so we took her to the vet and he kept her. She was there for 2 nights and now we have to keep her in a confined space to keep her from jumping or moving too much. I’m very worried about her. The vet thinks she has just bruised a nerve not broken anything as he did X-rays. He thinks she will be fine but it’s so hard to see her suffer. Tonight I’m meeting some of the George bookclub ladies at Peddlers On The Bend for dinner. The Italian there is lovely and we have such a laugh so it should be a fun night. We are all a product of our environment. Genetics does obviously play a certain role in our make up but I think most people discredit the role that ‘nurture’ has on our personality and temperament. I see this reflected in the people around me and hear it in the stories people share with me. Yesterday was the funeral of one of my daughter’s friends. He died of a heroin overdose. Did heroin never ‘go away’ or is it like leggings and is just making a come back? If so I wish it had stayed in the past (along with leggings for the most part). Everyone tends to think that currently the drug causing the most havoc as being Chrystal Meth or ‘Tik’ as it is called in South Africa. Heroin seems to have somehow developed this reputation of being somewhat cosmopolitan and more sophisticated than tik but both are deadly. I was talking to a friend who had previous issues with their child and drugs. They talked about how the child actually changed personality and started to sell their parents belongings, climbing out the window to meet their dealer, disappearing for days on end. I have heard this before and I likened it to a sort of demon possession. The person who once was driving that vehicle (the body) is no longer present or in charge. The driving force is the addiction. The addiction is telling that body that they will be in for a world of hurt very soon and that they need to make a plan for their next fix. They lose the ability to be human. All that matters is that drug. Today I was talking to someone who said that their brother has been a heroin addict for decades. He has run a successful international company but has now retired. He managed to live a productive life while still maintaining his addiction. But not knowing him one must ask at what price? Did he have a social life? Could he maintain loving relationships? I find it impossible to imagine anyone being able to have a completely normal life under those conditions. But then again, define normal? I see the impact of substance abuse every morning and evening when I leave work. Literally. A homeless addict lives in the alley between my office and where I have to park my car. I see him waking up, shaky, trying to get his self together to get out and find his next fix/drink/hit of choice. He reeks of urine. The whole alley is covered in pigeon poop and smells horrendous. There are giant rats running around in the shadows. I have had one nearly run across my foot, so the idea of trying to sleep out in the open while they run around nearby would be too much for most people to bear. And then when I leave I go a different route and there is another homeless man who lives on the edge of the building site. I see him sleeping there under his sheets of cardboard; he has one sock and no shoes. I have never seen his face but I would recognise those feet pretty much anywhere. And then today I read an article about a woman who had died and not been discovered for 6 years in her own garage. She lived alone and was estranged from her family. She travelled a lot so had her mail held at the post office for her and had a neighbour who mowed her lawn, so from the outside all appeared in order. I found it so sad that she had no one who cared, no one who even noticed her absence. I was standing in my kitchen the other day thinking how unattractive and boring it is, about how much I desire a new lush French farmhouse style kitchen. And then I immediately thought how greedy and unappreciative I am for not focussing on gratitude for the things I do have in abundance instead of focussing on superficial wants and imagined needs. Today when I go home I will be consumed with gratitude for all of my blessings. My warm dry home, my functional kitchen, the running water I have at my disposal, the flushing toilets, a warm dry bed (full of doggies of course) the green grass, the lovely garden, the stunning mountain I have as my view, an old but functional car, a well-paid job and most of all my beautiful loving family and pets. I hope you all have things to be grateful for, I hope you have a warm place to lay your head and someone who loves you. That is the least that we all deserve. I had such a fabulous weekend but this week has rattled along and I have been neglectful in sharing the fabulousness. We had a busy week last week and a busy weekend planned so on last Friday night we just had a quiet family night in and Norm cooked for us girls and made my fave, fillet steaks. He did mash and steamed veggies and it was yummy. I realise what a lucky woman I am. We rented some movies and watched the Seth Rogen film ‘This is the End’. It was a rather irreverent film about the Apocalypse. It was absolutely fabulous, I laughed so hard and was so mesmerised by the demons. 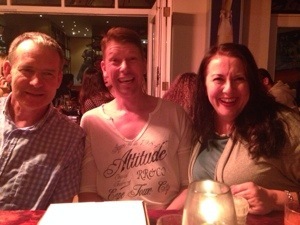 Saturday we had plans to go to Fat Cactus with friends we met originally on Twitter but whom I consider to be great pals now, a lot of fun and always up for a laugh. We sat outside in the crazy wind and sucked down pitcher after pitcher of their frozen strawberry margaritas. The problem is that they taste like a slush puppy and feel so harmless until you try to walk to the car and realise you have lost the use of your limbs. We ordered a big platter of all sorts of bits and pieces to share as a starter and then we all ordered mains. It became quite evident that our waitress was employed more for how she fit into the denim shorts she was wearing than for her skills as a waitress as she was pretty shite. She messed up 2 of our orders (as in brought completely the wrong dishes). Then when Di could not finish her food (due to having eaten half of the wrong order and then half the right order) her take away got put in the bin. As an apology they brought an additional shot of tequila. I had such a fab evening due more to the margaritas and my friends than due to the food..
My overall weekend planning was not so well thought out however as we had plans for brunch at Cheyne’s the next morning and Cheyne is one of the best chefs in South Africa. Sunday was the Argus cycle race which is run throughout the Cape Town southern suburbs. The Argus is the world’s largest timed cycle race with up to 35,000 cyclists competing. The route is insane and goes up and down mountains and some crazy curves. The route goes right through our village and results in the roads all being closed in and out. Several restaurants had breakfasts and brunches al fresco, sitting by the route and cheering them on. The wind was howling like mad so we were getting our heads blown off, so ended up moving inside to finish our last course. The menu on offer was a feast. 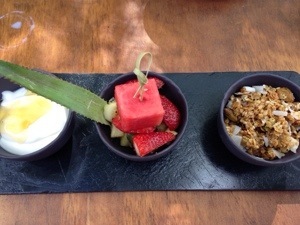 It started with beautifully presented fruit, yogurt with honey and granola. 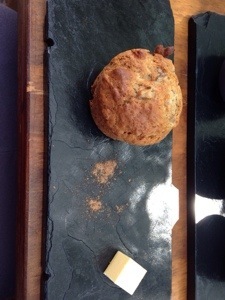 Next was a fresh baked cinnamon and apple muffin. The next course I wasn’t keen on, but miso soup is not my fave. 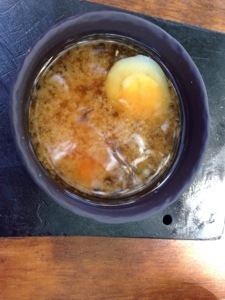 This was miso soup with a quails egg and mushrooms. The finale was moved indoors as the wind had become a bit unbearable. 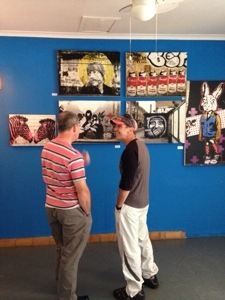 We were settled inside and got to view the cool art on display. The last course was eggs Benedict on steroids. It was on a toasted brioche, a nest of what tasted like maple glazed pulled pork. Oh my word it was heaven in my mouth!! 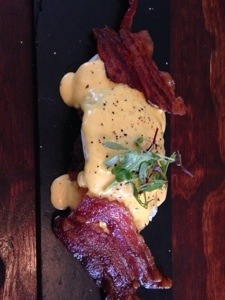 On top of that was the poached egg which was covered in hollandaise and topped off with perfectly crisped streaky bacon. It was an amazing meal. So much so I had to have a nap! We were entertaining that evening and Norm and I both had to sleep and woke just in time to tidy up. I had cooked a giant pot of chilli and our guests brought some to compare. It was all delicious but I was still hungover and tired and we all finished by 10 as it was a work night. There has been a lot of rain and flooding in the northern areas of South Africa. We have had some temperamental weather down at the coast but nothing like they are dealing with in the north. The impact of this nationally is that we are having load shedding again. For those non-SA peeps, this is where the national grid cannot cope with the demand of their end users and they just turn off entire areas of the national grid. They usually do this in a publicised, organised manner (well it is organised for Africa) and people know when to expect to be without power and can plan accordingly. However, this time we were given no warning at all. Yesterday our power went off in the middle of the day and was off for over 2 hours. It then came on for a bit, then went off at 6pm and remained off until after 9pm. This impacts us as it can lead to the food in your freezer melting, and we spend a crap load of money each month on organic, free range raw meat for our animals. It also means that my daughters are unable to do their course work and both are doing their honours degrees at University. Their laptops die, they cannot do research without wifi and they can barely see. When it is lights out in Hout Bay you can barely see your hand in front of you – we have no street lights and it is DARK. This can be lovely and romantic under some circumstances but for most….not so much. We sat with candles and lanterns and chatted in the dark. Norm ventured out for food to discover half the valley had power and at least the restaurants were open. Times like this make me think we are definitely in a third world country. There are several reasons for the inability to supply the country with electricity. SA also supplies 2/3s of Africa’s electricity. It is estimated that up to 40% of people do not pay for their electricity, particularly in rural areas. The rain has resulted in wet coal. The electricity supply in SA is still coal driven however we also have nuclear energy sources. Almost 90 percent of South Africa’s electricity is generated in coal-fired power stations. Koeberg, a large nuclear station near Cape Town, provides about 5 percent of capacity. A further 5 percent is provided by hydroelectric and pumped storage schemes. Wet coal is not as efficient as dry coal so the energy production is reduced during high periods of rainfall. The rumour is that we will possibly be subject to load shedding (no electricity) for a month, with each day estimated loss of 6 hours per household over 3 periods of time. The irony is that they have just hiked their prices again and the directors of Eskom (the power supply public utility) still take home those big bonuses. Did I mention the ridiculous levels of corruption and incompetence in SA? The root causes of the issues with electricity supply are incompetent governing. The country’s leaders have known that they have lack of capacity but has anything been done about it? No. The government here is predominately full of people who are more interested in filling their pockets than they are in doing the right thing for the country and its constituents. But that is the thing about Africa, it has some really fabulous points, we have an amazing view, live in a stunning city, have very cosmopolitan restaurants, wine routes literally on our doorstep. It also has a huge level of poverty, overpopulation in some areas and high levels of crime. I accept all of these vastly divergent points as what makes Africa Africa. Sort of like that annoying relative which gets on your nerves at times, then bakes you a cake and you realise they are actually OK. The SA cake equivalent is a stunning sunset, a beautiful day at the beach, a swim in my pool, the view of my mountains while drinking my morning coffee – the things that make life worthwhile.